Charles Callixte, Comte de Tusseau [d. 1864], Airvault, Deux-Sèvres, by 1861. Frédéric Spitzer [1815-1890], Paris, by 1881; (his estate sale, at his residence by Chevallier and Mannheim, Paris, 17 April-16 June 1893 [15 May], no. 664, sold for 10,200 francs); Goldsmith. (Lowengard, Paris); purchased 15 February 1906 by Peter A.B. Widener, Elkins Park, Pennsylvania; inheritance from Estate of Peter A.B. Widener by gift through power of appointment of Joseph E. Widener, Elkins Park; gift 1942 to NGA. Delange, Henri, and Carle Delange, Recueil de toutes les pièces connues jusqu'à ce jour de la faïence française dite de Henri II et Diane de Poitiers, Paris, 1861: 31. Edouard Garnier, "Collections de M. Spitzer: Céramique française," Gazette des beaux-arts, 2d ser., 24 (1881): 402 (one of five salts mentioned as in Spitzer's collection). The buyer's name is according to Edmond Bonnaffé, "Les faïences de Saint-Porchaire," GBA, 3rd ser., 13 (1895): 285. Widener collection records in NGA curatorial files. Exposition retrospective de l'art français, Trocadéro, Paris, 1889, no. 1162. 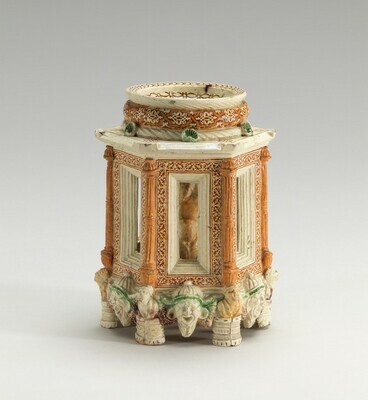 The basic body of the salt is formed of slabs of white clay, stamped and incised with designs in clays that show through the glaze as orange brownish and flecked red; there is applied decoration in pale brown and orange-brownish clays. The salt is covered entirely in a somewhat crackled transparent glaze, and the design is heightened in green and purple red. There are repairs to the feet and some shrinkage, chipping, and cracking where the underside of the base meets the edge: there is, however, nothing to support the statement in Bonnaffé 1891 that "la base de cette saliére a été refait d'après une autre pièce de la série des faïences de Saint-Porchaire," repeated in the Widener collection records ("the base is remade from another example"); no evidence has been found that the salt is not essentially in its original condition. There are minor repairs to the protruding ridge. It seems tha Bonnaffé confused this salt with one now in Brussels, which is stated by Delange and Delange 1861, no. 16, to have lost its original foot. Anne-Marie Mariën Dugardin kindly made a special examination of the Brussels salt for me, which confirmed that its foot is a replacement. Delange/Delange 1861, 31, no. 18. Fillon, Benjamin. L'art de terre chez les Poitevins. Niort, 1864: 92, no. 26. King, A.C. Henri Deux Ware, Photographs of twenty examples of this ware chiefly in English collections with an introductory notice. London (The Arundel Society), 1868: 8, nos. 50, 51, or 52 (mentioned). Garnier, Edouard. "Collections de M. Spitzer: Céramique française." Gazette des Beaux-Arts 2d ser. 24 (1881): 402. Bonnaffé, Edmond. "Les faïences de Saint-Porchaire." Gazette des Beaux-Arts 37 (1888): 327. Exposition rétrospective de l'art français au Trocadéro. Lille, 1889: 186, no. 1162. Exposition retrospective de l'art français. Exh. cat. Trocadéro, Paris, 1889: no. 1162. Bonnaffé, Edmond. "Faïences de Saint-Porchaire dites de Henri II." In La collection Spitzer: Antiquité, moyen âge, renaissance. 6 vols. Paris, 1890-1892: 129, no. 5, repro. Bonnaffé, Edmond. "Les faïences de Saint-Porchaire." Gazette des Beaux-Arts 3d ser. 13 (1895): 285. McCall, George Henry. "Saint-Porchaire in America." Arts and Decoration 10 (April 1919): 316, repro. Inventory of the Objects d'Art at Lynnewood Hall, Elkins Park, Pennsylvania, The Estate of the Late P.A.B. Widener. Philadelphia, 1935: 70, as c. 1560. Works of Art from the Widener Collection. Foreword by David Finley and John Walker. National Gallery of Art, Washington, 1942: 14, as Henri II Ware, Salt cellar. Wilson, Carolyn C. Renaissance Small Bronze Sculpture and Associated Decorative Arts at the National Gallery of Art. Washington, 1983: 204, no. 34, as c. 1555. Schnitzer, Barbar K. "The Sixteenth-Century French Ceramic Ware Called Saint-Porchaire." Ph.D. dissertation, University of Michigan, Ann Arbor, 1987: 201, no. 21. Distelberger, Rudolf, Alison Luchs, Philippe Verdier, and Timonthy H. Wilson. Western Decorative Arts, Part I: Medieval, Renaissance, and Historicizing Styles including Metalwork, Enamels, and Ceramics. The Collections of the National Gallery of Art Systematic Catalogue. Washington, D.C., 1993: 250-253, color repro. 251. Sturman, Shelley and Barbour, Daphne. "'Saint-Porchaire' Ceramic Bodies." Studies in the History of Art 52 (1996): 80, 82, 87, repro. no. 1.